Just Add 1 Scoop Of Powder Directly In Tumbler Or Vibratory Cleaner . 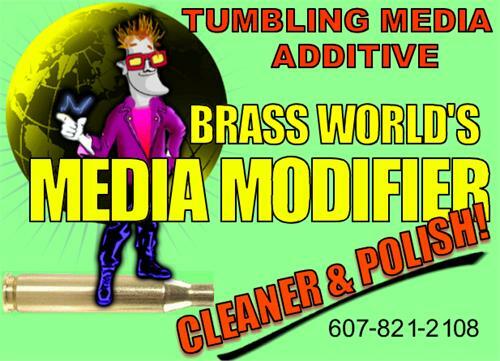 Customers Are Reporting As Much as A 40% Decrease In The Time It Takes To Polish There Brass Using Media Modifier Polish and Cleaner In Combination With Brass Worlds Media Blends. Cleaning Your Brass Will Help Reduce Wear And Tear On Your Expensive Reloading Dies,And The Chamber Of Your Firearm. Grit And Grime From Uncleaned Brass Gets embedded In The Inner Surfaces Of Sizing Dies, Scratching and Marring Every Case There After. The Same Grime Will Accelerate Wear In The Chamber And Feeding System Of Your Rifle Or Handgun. Media Modifier Is A Perfect Cleaner And Polish. With No Powder Contamination Or Red Film Like Red Rouge Products. Achieve the max when it comes to a match grade finish on your brass. Media Modifier Polish and Cleaner has been developed to maintain the luster of your brass by inhibiting the oxidation process that is a normal reaction in brass metal. Media Modifier™ is an excellent cleaner and polisher. Media Modifier eliminates the potential "MEDIA PACKING PROBLEM" in your cases which happens when you use liquid media additives. Just add Media Modifier™ Product To Your Favorite Media: For untreated media use no more than 1 of the enclosed scoop to to 4-6 pounds of media. Put the top back on and turn the tumbler on..
And remember a 4 ounce container of Media Modifier Polish and Cleaner treats 40-50 pounds of media. "Media Modifier™ " Products go a very long way". Don't Throw Away That Old Treated Or Untreated Media You Currently Have In Your Tumbler. Try and revive it with Media Modifier Polish & Cleaner. Start with a 1/4 scoop (1/8 ounce) of Media Modifier and see if you can bring that old dirty media back to life. If a 1/4 scoop does not bring it around try a little more Media Modifier. 1/2 a scoop ( a scoop comes with Media Modifier™ products) is approximately a quarter of an ounce and that should treat, or rejuvenate, 4-6 pounds of media. You Do Not Have To Rejuvenate Media Each Time You Clean Dirty Cases. Only Add a 1/4 Scoop Of Media Modifier™ Product When The Cleaning Cycle Slows Down. And remember a 4 ounce container of Media Modifier Polish and Cleaner treats 50 pounds of media. "Media Modifier™ Products go a very long way " Media Modifier™" is a trademark of Brass World Walton,N.Y. Keep Out Of reach of children Do Not take Internally-ventilation Recommended May cause Eye And Skin irritation upon Contact.After Handling wash Thoroughly.Keep Out Of reach Of Children.Brass World Can not Be held Responsible For Misuse Of This Product. Not For Wet Pin Polishing.Dry Media Only.